Norm R. Allen Jr. is a writer and secular humanist activist. On August 31, 1989 Allen founded African Americans for Humanism, the first organization focused on the promotion of humanism and humanist ideals among people of African descent. He was the executive director of the organization from 1991 to 2010 as well as editor of its quarterly, the AAH Examiner. 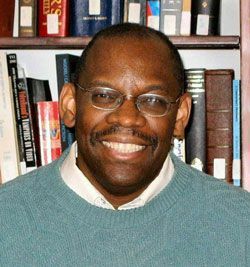 He also edited African American Humanism: An Anthology (1991) and The Black Humanist Experience: An Alternative to Religion (2003). Allen views secular humanism, a human-centered approach to living drawing upon reason, science, and secular ideals and guided by empathy and compassion, as particularly relevant for African Americans because in the narrative of American history black freethinkers have largely been ignored. The oldest of three boys, Allen was born in Pittsburgh, Pennsylvania, on November 12, 1957 to Fayevern Allen, a postal employee, and Norman Robert Allen Sr., a businessman. Raised in an atmosphere conducive to intellectual exploration, Allen’s journey to secular humanism began in childhood when his mother encouraged him to question religion and keep an open but skeptical mind. She assured him that no matter what path he chose, even atheism, she would still love and support him. Allen’s father was a member of the Organization of Afro-American Unity, headed by Malcolm X, in Harlem, New York. At age 11 Allen read his first “serious” book, The Autobiography of Malcolm X, which remains his favorite to this day. Allen was also deeply influenced by the books of the journalist and historian Joel A. Rogers. Allen attended Wilkinsburg High School in Pennsylvania, and then the University of Pittsburgh. Afterwards he worked as an accounting technician in the Air Force for four years and later sold fine art with his artist brother, Jay Allen. Allen also attended the State University of New York at Buffalo, majoring in English. In 1989 Allen began working for the Council for Democratic and Secular Humanism (CODESH) in Buffalo. While there Allen was inspired to establish African Americans for Humanism to explore the ideas and work of black deists, humanists, agnostics, freethinkers, rationalists, and atheists such as Frederick Douglass, A. Philip Randolph, Carter G. Woodson, Zora Neale Hurston, James Baldwin, Lorraine Hansberry, and Richard Wright, whose non-religious views have garnered little scholarly or popular attention. In 1995 Allen wrote a major statement in defense of evolution and against creationism and “intelligent design” for Voices for Evolution, a publication of the National Center for Science Education (NCSE). AAH was the only black organization to participate in this project. Since 1997 Allen has appeared on a number of nationally televised programs including the O’Reilly Factor, BBC News, and C-Span. He has also been featured on National Public Radio (NPR) and in other media outlets. Allen is currently the secretary of the Institute for Science and Human Values and editor of the Institute’s journal, The Human Prospect. He also writes a regular column titled “Reasonings” for the Institute’s website. Allen is at work on his third book, Secular, Successful and Black, and continues to write numerous articles while traveling the world promoting secular humanism and skepticism. Norm R. Allen, Jr., ed., African American Humanism – An Anthology (Buffalo, New York: The Tuttle, Prometheus Books, 1991); http://aahumanism.net/info/about_aah; http://www.secularhumanism.org/index.php?page=what&section=main; Personal Email Correspondence from Norm R. Allen Jr. to Olga Bourlin (August 2012 and October 2012). (August 2012 and October 2012).